"Amy Allen was a member of a rogue Black Ops Military Group and was threatened to be arrested, until she begged her father, the head of Project: Quantum to be recruited for the project. The Project bonded the same Alien metal Dilustel to her skin that compromises the body of Captain Atom. Unlike Captain Atom Bombshell can retract and engage her Dilustel skin shell at will, which she discovered when Protect: Quantum tried to have her murdered for joining the Teen Titans. 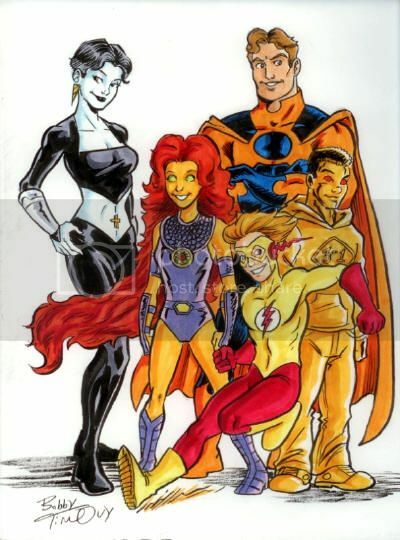 Bombshell and the Teen Titans discovered from Amy's dad that it was not Project: Quantum that put the hit out on her, but a rogue group within it, and what none of them know is that the leader of the group is Bombshell's mother. 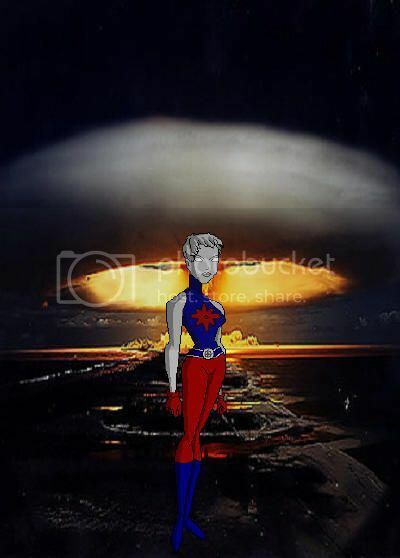 Bombshell is not the by the book soldier that Captain Atom is, she is more of a shoot now and sort later frontline soldier which often causes conflict with everyone." 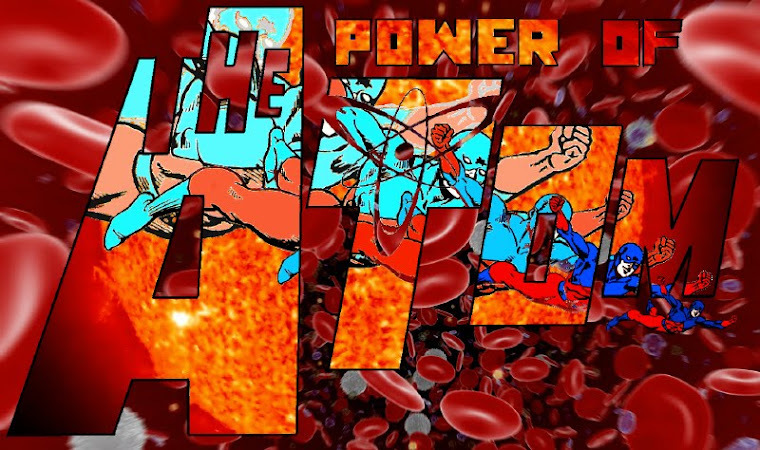 Captain Atom sacrificed himself when he absorbed Major Force's energies when Superman and Batman were wanted by the then President Luthor. 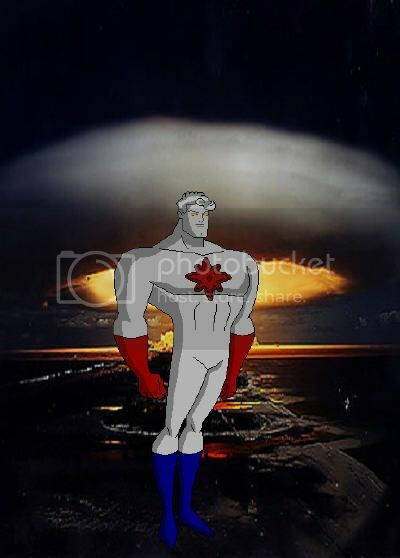 Captain Atom's atomic reaction had an unforeseen outcome, instead of a time jump, he had a reality slide, ending up on another Earth, where he met and fell in love with Nikola Hanssen who is the new Void Host. Captain Atom's appearance was altered due to him possessing a piece of the Void in him, and when Nikola removed it Captain Atom slid back to the Post Infinite-Crisis New Earth, ready to resume his role of hero while still missing the love he had shared with Nikola. 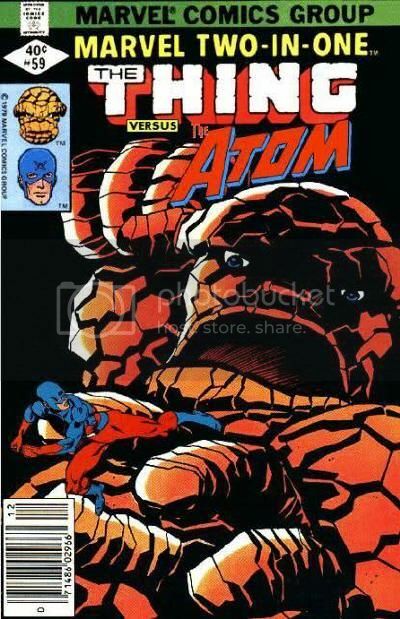 So I guess physicist Ray Palmer didn't have any more luck curing Ben Grimm than Reed Richards, eh? Nice, clean mock cover! 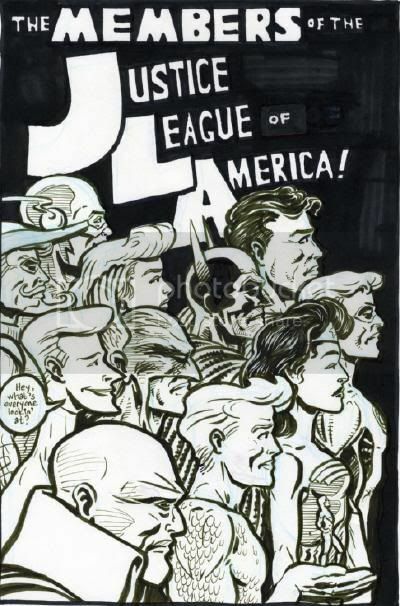 Pictured are Flash, Green Arrow, Black Canary, Superman, Batman, Green Lantern Hal Jordan, Elongated Man, Hawkman, Wonder Woman, Aquaman, Martian Manhunter and the Atom. This was from the MCBA FallCon Comic Book Celebration of Minnesota. 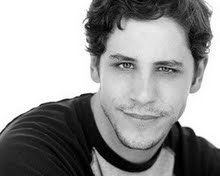 Mundt, artist of The Adventures of Monkey, can be found at World of Monkey Productions.